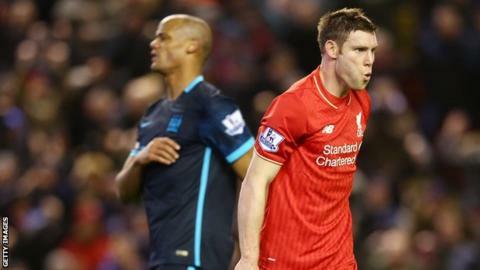 Manchester City cannot slip up again if they are to win the Premier League title, says captain Vincent Kompany. City lost 3-0 loss at Liverpool on Wednesday - their third league defeat in a row - and now trail surprise leaders Leicester City by 10 points. Title rivals Arsenal and Tottenham also lost, but centre-half Kompany said: "We can't make any more mistakes." City are at home to bottom club Aston Villa this weekend, while Leicester visit Watford and Arsenal face Spurs. "It is an awkward season," said Kompany. "Good for the fans, but you can't predict anything, can you? "If there is one guarantee for this season, it is nothing is sure." City, who have a game in hand on Leicester, have now lost eight times in the league this season, while Leicester have lost just three. The last time City suffered three league defeats in a row was in 2008. "We will see what is happening at the weekend," said Kompany. "We need to get the three points and maybe Leicester will drop some points."